Happy (belated) Easter, friends! I spent the weekend on Skidaway Island off the coast of Savannah, GA with my family and it was just lovely. I hope you all had a great holiday as well! I bet you were expecting a chocolate recipe. But look at me, posting vegetables. Keeping you guessing. In truth, I put a sizable dent into the 5 lb bags of both peanut M&Ms and regular M&Ms on Sunday and then felt a little sick. So now I’m fixing rabbit food to balance out the sugar coma. You understand. “There was once a man driving down the road. He saw a bunny scamper out in front of his car. He tried to slow down and swerve, but unfortunately he hit the bunny. He jumped out of the car and ran to look, and it turns out that the bunny was dead. It was the Easter Bunny. There were chocolates and Easter baskets strewn about. The man tried to bring the creature back to life, but to no avail. The bunny was limp and dead. The man walked to the side of the road and was crying. A woman saw him, and pulled her car over. She asked him why he was upset and he pointed to the dead bunny in the road. She pulled a can out of her bag, and walked over and sprayed the dead bunny. All of a sudden, he popped up. The Easter Bunny scooped up the candy and Easter baskets, and hopped along on his way. The man was shocked! He asked the woman what was in the can, and she showed it to him. Really, Father? Proclaiming that the Easter Bunny was dead approximately 17 times for the sake of a joke? All I have to say is, it’s a good thing children don’t listen to the homily in church, or Savannah would be full of youngsters running around spritzing roadkill with hairspray. Bring back Bambi’s mother! 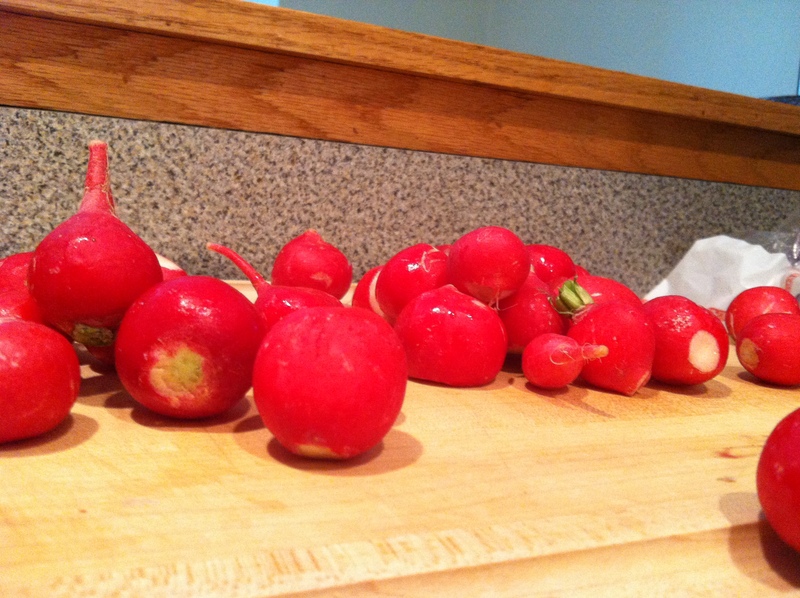 Trim the radishes and slice them in half (or thirds, depending on size). 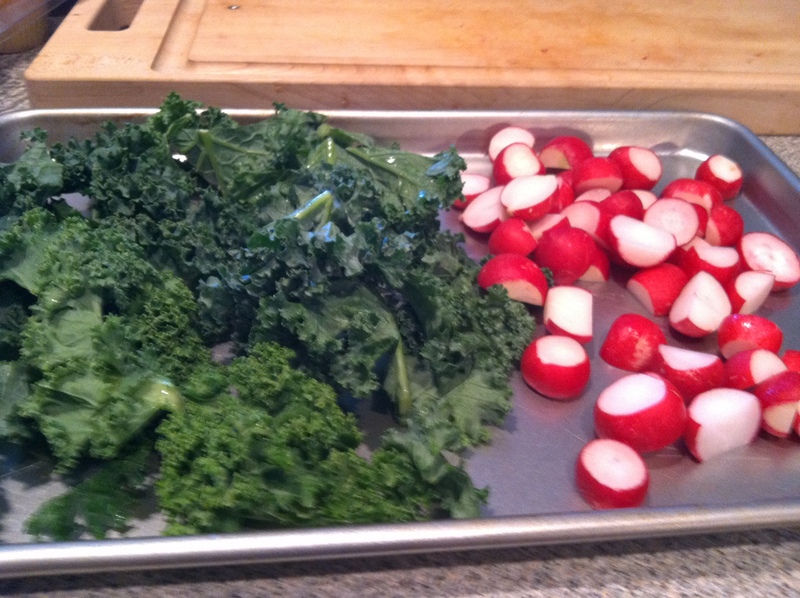 Toss radishes and kale with a little bit of olive oil, salt, pepper, and garlic salt. You can add any other seasonings you like. Roast at 400 degrees for 10-12 minutes, turning once in the middle. You may need to roast the radishes a little longer depending on the size. The kale gets nice and crunchy and the radishes are a little sweet. Yum. Oh and the whole “I feel sick from too much chocolate” thing? I just had four Samoas and a Kit Kat. Whoopsies.